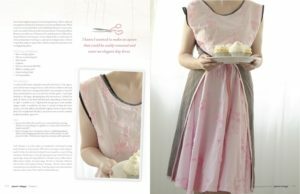 I created this reversible house dress in memories of my grandmothers who taught me how to sew. They often donned these beautiful house dresses to cover their day dresses, just in case company would just stop by to visit, they would appear graciously beautiful and coiffed. 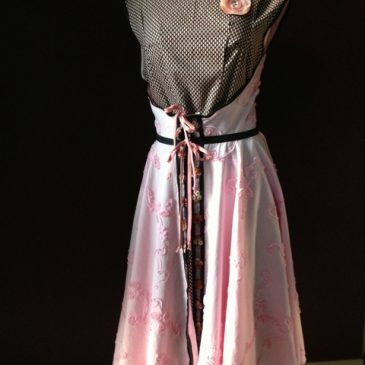 I used an old vintage retro pattern combine the pink embellished material with a black/pink material, making it reversible in case you spilled something on the front. Fabric and lace was found in vintage material warehouse in San Fransico in the bedding department. Of course, I had other ideas! 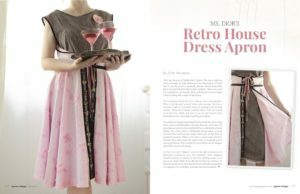 Ms. Dior’s Retro House Apron was featured in Apron.ology 2014, 3rd Place sewing San Diego Fair!